The actual size and weight of about 20kg. These parts can be exposed the outside. The white rhinoceros are herbivorous mammals belonging to the Rhinocerotidae family. They can measure 4 meters in length to 2 m high with a weight that can approach 3 tons. These are the largest land mammals after the current elephant. The word rhinoceros comes from the Greek rhinos, nose, and keras, horn, because it has one or two horns on the nose, not the front like other horned mammals. Describes four types and five species still alive. The visible characteristic of the rhinos is their two horns on the nose. The front horn grownes on the nasal bone, the back horn is on the front of the skull. Despite their hardness, horns do not consist of a bone, but agglutinated keratin, it is a fibrillar protein. The largest known horn measured 1.58 m.
We distinguish rhino’s horn from others horn due to the existence of hair on the horn and the interior that is full contrast to the ivory that is empty. 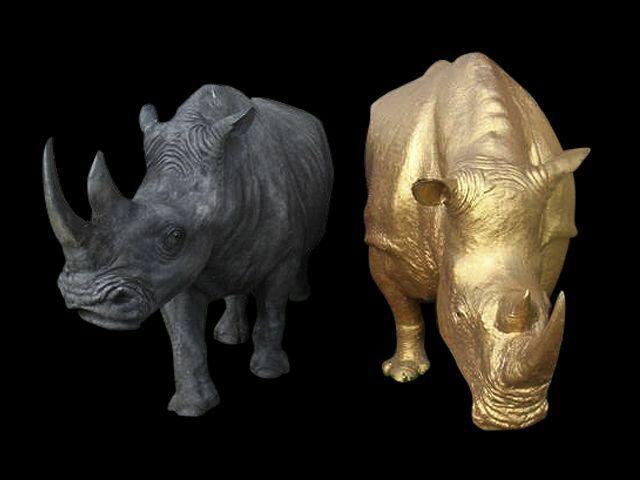 Rhino horns have a generally dark color that may turn light brown, depends on the horns. Rhinos have a massive body and fat and short legs. Each foot has three fingers, hence the imprint characteristic cloverleaf. The skin is thick and gray or brown. In the Asian species, the skin at the beginning of the neck and legs is so wrinkled that it gives the impression of a shield. Rhinos have poor eyesight, but this disadvantage is offset by a subtle sense of smell and excellent hearing. They have impressive muscles, allowing them to run very fast, up to 50 km/h. Very agile, they can also turn around at full speed. Males do not have scrotum: testicles are inside the body. They normally live solitary in Savanna, but sometimes in small herds. They are both polygamous and polyandrous. Males and females have several partners. They marks their territory with urine and droppings. They sleep during the day, they are most active at dusk and at night. After a gestation period of 15 to 18 months, the young born and it can stay two and a half years with the mother. These animals avoid men, its main enemy. If they feel threatened, they attack. Today, it remains only 18.000 rhinos in the wild and 1.000 in captivity. All rhino species are considered endangered. The rhino is locally subject to a program of reintroduction projects.